Russian President Vladimir Putin sat down with Fox News’ Chris Wallace for a major interview on Monday. Russian President Vladimir Putin, in an occasionally combative interview with Fox News’ Chris Wallace, called it “utterly ridiculous” that some people think the Russians could have swayed millions of American voters in the 2016 election, while insisting his country did not have dirt on President Trump or his family. 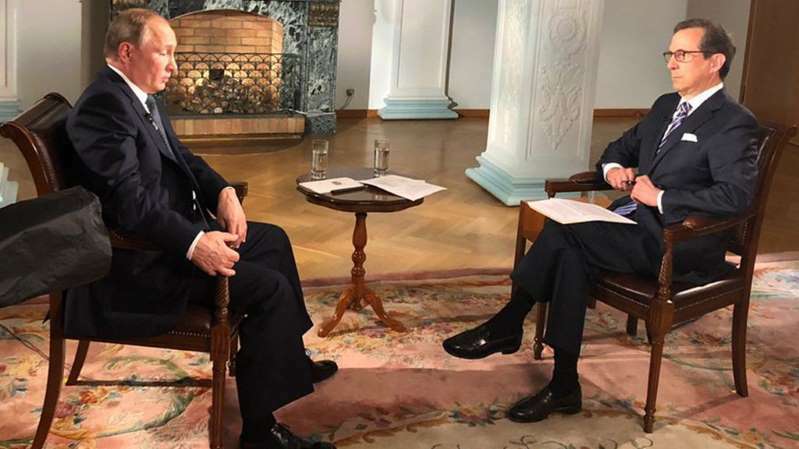 The Russian president sat down for the interview airing on “Special Report” Monday after his summit earlier in the day with President Trump and other U.S. officials in Helsinki, Finland. Trump has faced harsh bipartisan criticism back home for his press conference with Putin, with lawmakers claiming Trump missed a key chance to "stand up" to the Russian president on election meddling. The summit came just days after the Justice Department announced the indictments of a dozen Russian intelligence operatives for allegedly hacking Democratic targets in the 2016 U.S. presidential election. At one point in the interview, Wallace tried handing Putin a copy of the indictment. But Putin motioned for him to put the papers on a side table instead. The rumor of the Russians having compromising information on Trump was a central claim in the unverified and salacious dossier written by British ex-spy Christopher Steele and financed by Democrats that made its way to the FBI during the early stages of the Russia investigation. Putin argued Russia wouldn’t have the resources to track Trump had it wanted to do so. To make a point, Putin said the annual St. Petersburg Economic Forum usually draws 500 business leaders and most of them are industrial tycoons on a “greater scale” than Trump as a businessman. Also during the interview, Putin said Russia would respond “negatively” if NATO were to add either Ukraine or Georgia to the alliance. “For us, well, it's a direct and immediate threat for our national security…moving this NATO infrastructure towards our borders would be a threat, and…the reaction would be extremely negative,” Putin said. Wallace also asked Putin about Russia’s involvement in Syria, citing independent monitors saying Russia has bombed civilians in Aleppo and Ghouta. During the interview, Putin also pushed back against the characterizations of him as a strongman, an autocrat.